We’d love your help. Let us know what’s wrong with this preview of African American Folksong and American Cultural Politics by Bruce M. Conforth. 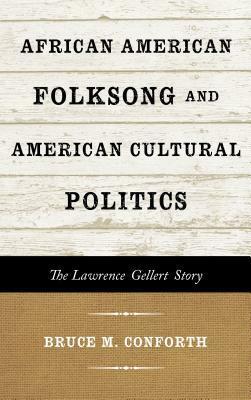 In African American Folksong and American Cultural Politics: The Lawrence Gellert Story, scholar and musician Bruce Conforth tells the story of one of the most unusual collections of African American folk music ever amassed--and the remarkable story of the man who produced it: Lawrence Gellert. Compiled between the World Wars, Gellert's recordings were immediately adopted In African American Folksong and American Cultural Politics: The Lawrence Gellert Story, scholar and musician Bruce Conforth tells the story of one of the most unusual collections of African American folk music ever amassed--and the remarkable story of the man who produced it: Lawrence Gellert. Compiled between the World Wars, Gellert's recordings were immediately adopted by the American Left as the voice of the true American proletariat, with the songs--largely variants of traditional work songs or blues--dubbed by the Left as "songs of protest." As both the songs and Gellert's standing itself turned into propaganda weapons of left-wing agitators, Gellert experienced a meteoric rise within the circles of left-wing organizations and the American Communist party. But such success proved ephemeral, with Gellert contributing to his own neglect by steadfastly refusing to release information about where and from whom he had collected his recordings. Later scholars, as a result, would skip over his closely held, largely inaccessible research, with some asserting Gellert's work had been doctored for political purposes. And to a certain extent they were correct. Conforth reveals how Gellert at least "assisted" in the creation of some of his more political material. But hidden behind the few protest songs that Gellert allowed to become public was a vast body of legitimate African America folksongs--enough to rival the work of any of his contemporary collectors. Had Gellert granted access to all his material, scholars would have quickly seen that it comprised an incredibly complete and diverse collection of all African American song genres: work songs, blues, chants, spirituals, as well as the largest body of African American folktales about Irish Americans (what were referred to as "One Time I'shman" tales). It also included vast swaths of African American oral literature collected by Gellert as part of the Federal Writers' Project. In African American Folksong and American Cultural Politics, Conforth brings to light for the first time the entire body of work collected by Lawrence Gellert, establishing his place, and the place for the material he collected, within the pages of American folk song scholarship. In addition to shedding new light on the concept of "protest music" within African American folk music, Conforth discusses the unique relationship of the American Left to this music and how personal psychology and the demands of the American Communist party would come to ruin Gellert's life. To ask other readers questions about African American Folksong and American Cultural Politics, please sign up. This book, written by a very interesting friend of mine, was an informative and readable scholarly discussion of the life of historically obscure song-catcher Lawrence Gellert and the milieu of folk music collecting. I learned a lot about a field I know little about, but which is background to music I greatly enjoy. The most prominent question that remains unanswered, though, is the simple question: What is a folksong? A few years ago, folk singer Michael Cooney presented a series of three talks This book, written by a very interesting friend of mine, was an informative and readable scholarly discussion of the life of historically obscure song-catcher Lawrence Gellert and the milieu of folk music collecting. I learned a lot about a field I know little about, but which is background to music I greatly enjoy. The most prominent question that remains unanswered, though, is the simple question: What is a folksong? A few years ago, folk singer Michael Cooney presented a series of three talks about folk music at The Ark in Ann Arbor. One of his early presentations related to that very question. Basically, Cooney said that "What is a folksong?" is a question to which there are a multitude of answers even in the folk music tradition. In my limited memory of the talk, I think at the most basic level, the disagreement comes down to whether folk music is to be viewed stylistically - acoustic music, truly traditional or not, that has a sound reminiscent of old-time traditional songs - or culturally - songs that originated in a particular community, generally of anonymous origin, and of which there are numerous variants that have emerged organically through time. Bruce clearly (in my reading) subscribes to the latter definition. That leaves me wondering whether Woody Guthrie, Bob Dylan, and others generally thought of as folk musicians indeed actually sing folk music, since their compositions are unequivocally their own (albeit honestly, unlike Gellert's published "folk" songs, some of which he apparently was either complicit in composition or actually wrote himself, still with the claim that they were traditional folksongs of the African-American culture from which he collected). It's fun when a book leaves one with a question which is probably never going to have a definitive answer (since the answer depends on the perspective of the person answering), but which is nonetheless a most interesting concept to muse on.